While Austin has its fair share of adult-only attractions like the fairly new Prohibition Creamery, SoulCycle spin classes, and fancy restaurants like Lenoir or Juliet, there's no reason a kid can't enjoy the sunny, fun-spirited, weird city, too! Here are our #guildpicks for a kid-friendly, kid-filled weekend. Please share your own favorites that you've enjoyed with your family below in the comments. Check into your Guild room & get settled. A two-bedroom suite is perfect for a family of 4 or more! Let the kids chill with kid-friendly Netflix or grab them a snack from the kitchen (did you know you can personalize your stay & order groceries to be delivered before you even arrive?!). Meanwhile, introduce the baby to his own unique space and unpack your bags in the master bedroom where you'll be sure to get a good nights' reast on our Tuft & Needle mattresses. Chuy's is the original spot for Tex-Mex in Austin. Dine amongst hubcaps and wooden fish: the décor is definitely unique and the food? Super-flavorful and comforting. For a healthy alternative, check out Casa de Luz: a peaceful spot with set menus of vegan, organic & gluten-free breakfast, lunch & dinner. The self-service dining room is conducive to bringing the kiddo's along and there's even a playground for when they've finished eating. The South Congress Bridge Bats are a sight for all ages. The Bats put on a nightly spectacular show of dynamic aerial flight typically lasting 45 to 60 minutes long, beginning at Sunset. In our opinion, the best spot to watch isn't from the bridge (because the bats blend in with the color of the water), but from the grassy knoll right below the South Congress bridge - there's a set of stairs leading you down on the south side of the bridge. Bring a picnic blanket, get cozy, and watch the show! We know the kiddos wake up early, so make the most of it and walk (or rideshare!) on over to Paperboy from your Guild room. This sweet food truck will make all your breakfast dreams come true with yogurt parfaits, texas potato hash, and sweet toast. Kids guaranteed to fill their tummies. 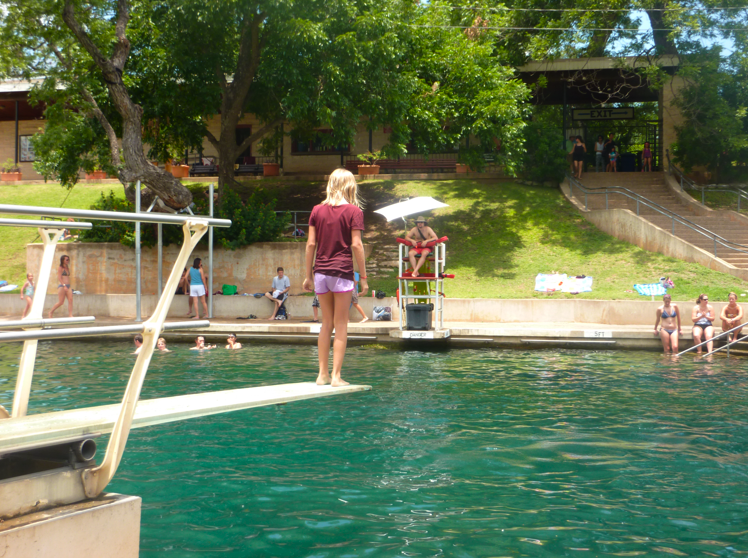 Head to Deep Eddy Pool where the water is clear, cold, and spring-fed. Kids and adults alike love this spot. $8 entry for non-residents. Spread out a blanket and chill in the shade for a minute, too! Alternatively, try Barton Springs Pool. This pool has a more natural look and measures three acres in size. It is fed from underground springs with an average temperature of 68-70 degrees, ideal for year-round swimming. Here in March? Check out the Kite Festival! 9am (alternate) - "Zilker Zephyr"
Your clan not so much the "swimmer" type? Not to worry - Zilker Park is home to a multitude of other activities. Little ones tend to go batty over The Zilker Zephyr Miniature Train, which provides a 20-25 minute train ride around the park. It's a great way to get a tour of Zilker - including Barton Creek & Lady Bird Lake - at a calm pace. $2 for kids, $3 for adults, babies under 1 ride free (don't forget cash)! The Zephyr opens at 10 am, so beforehand, why not bring a kite to the sprawling fields of Zilker Park and have the kid's try their hands at some kite flying? Sit at the counter for a fun old-timey vibe! Counter Café on North Lamar - just minutes from Zilker/Deep Eddy in a rideshare - is a great spot for all ages. Breakfast is served all day and everything is farm-fresh. The kids will enjoy classics like the Counter Burger while adults can indulge in plates such as the Counter Crab Cakes or the Polenta Fried Oysters. If it's nearing nap time, head over to Book People and take a look upstairs in the kid's section for the best selection of kid's books. This bookstore is renowned for their selection, regular readings, and quirky gift items. Then, head back to your temporary Guild Homestead to let the little ones rest. While they sleep, enjoy some time on the patio with your loved one, get some work done at the desk, or simply Netflix & Chill! Depending on what your crew enjoys, there are a number of kid-friendly cultural options throughout Austin. If your group likes exploring, the Cathedral of Junk is only a 15-minute drive from Downtown Austin. "From the street, it's invisible. The man who built it, Vince Hannemann, is similarly unassuming. He didn't build the Cathedral to get attention. Although he's been dubbed a "yardist" by the local art community, he's a very down-to-earth guy who harbors no illusions about the significance of his creation. 'I just did it because it was kinda cool,' he tells us. 'It's my clubhouse. It's fun. Kids, when they come through, they know what it is.'" Laguna Gloria is another option: roam through acres and acres of contemporary sculpture outside to let your little ones breath in the fresh air. The Laguna Gloria site has been declared a national treasure and is on city, state, and national registers of historic places. Finally The Bullock State History Museum also proves an exciting stop. The museum has three floors of interactive exhibits; the first-floor theme is "land," the second-floor theme "identity," and the third-floor theme "opportunity." Before you make the trip, take a look at "What to See & Do" to plan your route! When all that exploring has you tuckered out, head to the East Side for some Detroit Style Za at Via 313. Their original location is the most fun, in our opinion: a food trailer right outside of Violet Crown Social Club (where mom & dad can get a cocktail, if they like). Send one of the parents out to grab coffee on-the-go and some breakfast tacos from Brew & Brew while the other parental gets the kiddos ready. This is also a great place to catch up on some work if one of you needs to catch up on the office emails. 11am - "Exploring Before Takeoff"
The best way to fly back home with kids? To make sure they'll fall asleep as soon as you board the plane. Make sure you tucker them out! The Thinkery is Austin's newest home for “why” and “how.” "A place where science and families play side by side. Where people connect with ideas by doing, making and experiencing. It’s a foundry for a new generation of innovators and creative problem solvers. And it’s a heck of a good time." If you want the little ones to explore in the great outdoors before boarding, take them to The Austin Zoo. Peacocks roam free throughout the grounds and the zoo's mission is to assist animals in need through rescue, rehabilitation, and education -- so you can feel good about going here. However you spend your time, Austin is a wonderful place to bring the whole family. Let us know how you enjoy this weird & beautiful city in the comments below.